Nowadays a lot of cash-rich companies choose to repurchase shares instead of paying dividends since the first allows them the financial flexibility to pursue growth opportunities. Additionally, announcing regular dividend increases the long-term pressure because to the investors’ eyes suspending that dividend later is worse than never announcing it in the first place. As a dividend growth investor, I’m looking for opportunities to invest in stocks that have a high likelihood of increasing their dividend in the future. However, in some cases, companies meet the requirements to pay a sustainable dividend but delay the decision to indulge shareholders until the right moment. I believe Vera Bradley is one such case and the right moment is very soon. Vera Bradley is a great value-dividend investment opportunity that would fit well into a plan to retire off dividends. Vera Bradley Inc. (NASDAQ:VRA) is an American company that designs and sells a variety of products, including women's handbags, luggage and other travel items, fashion accessories, and unique gifts. It is most recognized for its original colorful patterns and quilted-cotton bags. 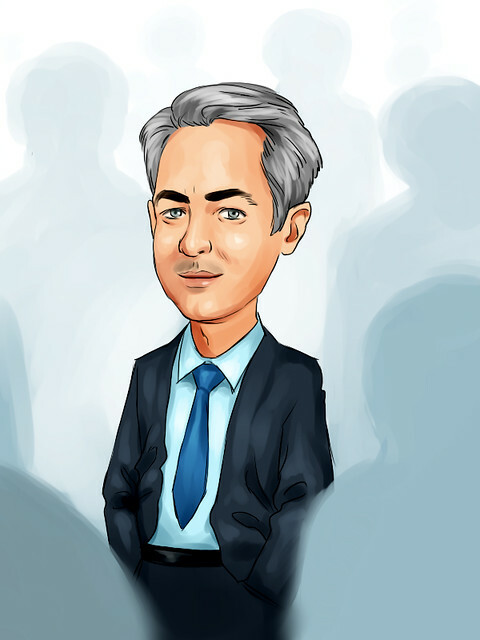 I think VRA is ready to pay dividends for a number of reasons that range from its maturity, financial position, liquidity, and even recent stock price performance. There are a few hints signaling the company is maturing. Sales growth has been slightly negative for a number of years averaging -4%/year since 2014. The interesting thing is that sales from direct business, which currently contribute to over 75% of total sales, are actually growing although at a very slow pace (average 2.3%/year), as typical mature companies do. 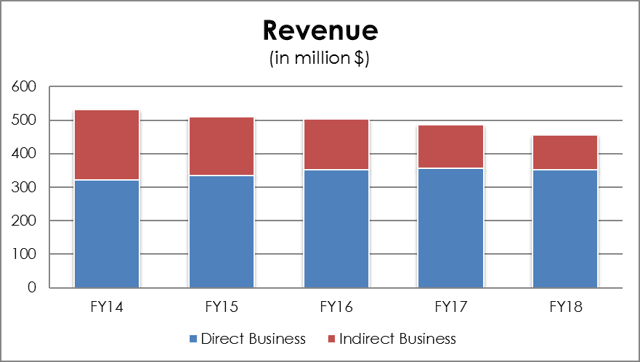 Direct business sales are made from VRA’s own stores and outlets and in the last 5 years, the segment grew 9.6% from $321 million in 2014 to $352 million last year. Store count consolidation is also a sign of maturity. Vera Bradley currently operates 159 stores, the same number as in FY17 and nine more than in 2016. The company disclosed the intention of closing 45 underperforming stores up to 2021 and open just 6 new outlets in FY2019 so we’ll probably start seeing that consolidation soon. We all know that being in such a stage of the business life cycle doesn’t necessarily mean less investment in growth. In fact, some companies turn to inorganic growth as a strategy to keep adding value to shareholders. That, of course, will require some financial flexibility. Could that delay VRA’s dividends? Fashion retail is evolving really fast as new technologies provide more analytical tools, distribution channels, advertising methods, and overall reshape the brand’s relationship with customers. In its latest report on The State of Fashion, consultancy firm McKinsey stated about players in the industry: “Regardless of size and segment, players now need to be nimble, think digital-first, and achieve ever-faster speed to market (…). They also need to invest in enhancing their productivity and resilience, as the outlook is uncertain. This perspective is in line with Vera Bradley’s recently launched strategic plan: Vision 20/20. This 3-year plan comprises product and pricing initiatives, as well as selling, general, and administrative (SG&A) expense reduction initiatives. This means we can expect a decrease in the amount of clearance merchandise, a more streamlined offering, diminished corporate structure, and a decline in marketing expenses. In summary: operational efficiency. So going back to the question about VRA’s growth strategy requiring financial flexibility, I believe the answer is negative. It’s not in the company’s plans to expand its operations by purchasing other businesses, but rather to focus on its own structure and efficiency, which in turn should release more funds to pay back shareholders. Now that we’ve established Vera Bradley is mature enough to pay dividends, it’s time to find out if it has the financial means to pay those dividends by assessing its financial position. The company is debt-free since FY14 after repaying $146 million from FY10 to FY13. Although it’s not at all deal breaker for an indebted firm to pay dividends, it’s certainly easier to take the step when there are no other financial constraints. In terms of liquidity, current assets amount to 6 times current liabilities. Of course, a big part of current assets include inventory, but cash position alone is more than enough to cover all short-term obligations. 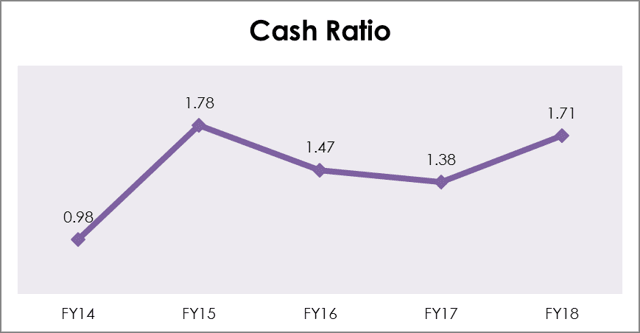 In the last five years, cash ratio averaged 1.5 with a minimum value of 0.98 in FY14 demonstrating a sustained liquidity level throughout the years. As of the last quarter, VRA holds over $100 million in cash and short-term investments. That too has been sustained over the last few years. To get a perspective, that’s almost 30% of current annual sales compared to Fossil’s 8%, 11% of Nike’s, and even 25% of Apple. When evaluated by its Price to Cash ratio, Vera Bradley is one of the cheapest consumer goods stocks in the NASDAQ exchange. From what we’ve seen so far, VRA is in a good place to payback shareholders and I believe the company is about to declare a regular dividend based on a healthy payout ratio. I support that belief on its strong free cash flow (FCF) generation. In FY18 FCF was $30.8 million, or $0.89 per share against $1.23 and $0.45 in FY17 and FY16, respectively. Taken into account the results of Vision 20/20 initiatives already achieved, there are good reasons to believe that profitability will reverse to a positive trend and capital expenditures will be more closely monitored. In fact, FCF for the last 12 months is up to $37 million, reflecting an improvement of 330 bp to 4.8% and a decline in CAPEX. As Vera Bradley moves away from clearance sales, revenue has been missing its targets and investors have been punishing the company. At $9.72, the stock price is down 44% from its yearly high in September. I believe that’s one more reason to monitor the stock closely. At current levels, the stock can jump really fast after a dividend announcement. VRA’s growth plans are focused on internal efficiency which means there are no plans for big capital expenditures. That combined with a great financial position and an improving FCF makes the fashion retailer a potential dividend-paying stock. One could argue the company is already repurchasing stock, but as we mentioned at the beginning that’s not an as strong commitment as paying dividends, and investors are pricing that. With an average 40% payout ratio among fashion retailers in the US, VRA’s dividend for FY19 (based on current guidance) would be about $0.23/share or 2.4% yield with room to grow. With that in mind I’m adding VRA to my watchlist and tracking the company’s cash position. Author: Millionaire MobMillionaire Mob is a former investment banker that hung up his suit and 'deal sleds' to focus on ways to travel the world, build great relationships and learn. I am looking to help others learn passive income techniques, invest in dividend growth stocks, earn travel rewards and achieve financial freedom. I increased my net worth from -$60,000 (yes, negative) to over $500,00 in 5 years. I used Personal Capital to track my net worth. I love their platform.